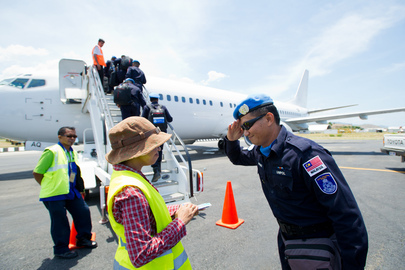 Malaysian police officers, formerly serving with the UN Integrated Mission in Timor-Leste (UNMIT), say goodbye as they board their return flight home in Dili. Malaysia is among the countries to have contributed the most police officers to UNMIT since the mission’s establishment amid the Timorese crisis in 2006. Some 240 officers from Malaysia have been awarded the UN Service Medal and the Timor-Leste Solidarity Medal for their contribution to stability and peace in the country. Today Timor-Leste has assumed its own policing responsibilities and democratic presidential and parliamentary elections were held peacefully in 2012.